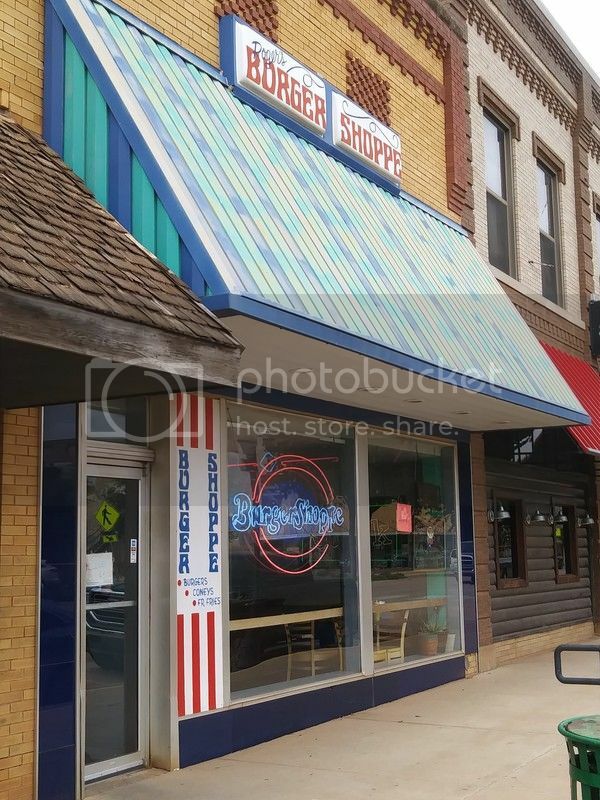 Burger Shoppe in downtown Kingfisher, OK. Double deluxe fried onion burger. Excellent! Great specimen of a burger!! Part of the Hot Dog University curriculum is a field trip to the Red Hot Ranch on Ashland Ave in Chicago to learn how to make the ultimate smash burger. When it comes to a flat griddled, double cheeseburger, the Red Hot Ranch has become my all time favorite cheeseburger. Check out the specialized equipment for flattening the burger and scraping it off the griddle. That's a great looking burger iceomat! No surprise that comes from the great state of Oklahoma. I was pleasantly surprised by how good it was. I haven't been to Nic's Grill in a few years but this burger was right up there. 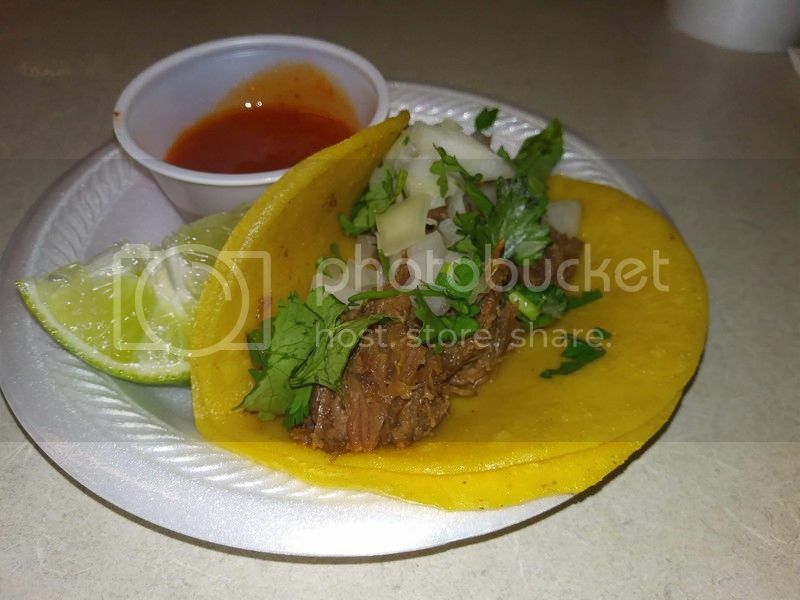 They also have tacos and burritos here and I had a very tasty, if a bit small, barbacoa taco as well. Real Roadfood!!! It looks really good. Thanks! I went to the relatively new Philadelphia branch of NYC's P.J. Clarke's today for lunch. This was the second time I have eaten there and I had a burger both times. It was perfectly medium rare the first time. 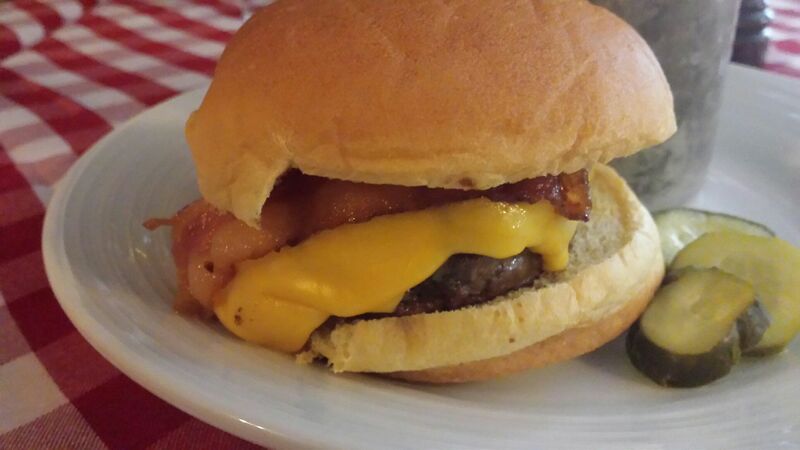 Today's burger, which is pictured below, was a little overcooked. I'd say it was at least medium. I ordered it medium-rare. But it was so juicy and flavorful that it's not a major complaint. The last time I was there, I had a basic cheeseburger. 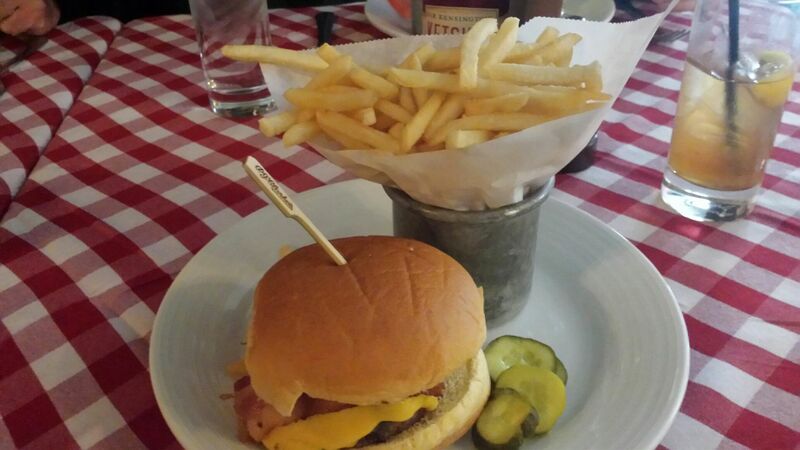 This time, I ordered the Cadillac Burger, which includes bacon. As usual, I asked for it to come with no lettuce or tomato. P.J. 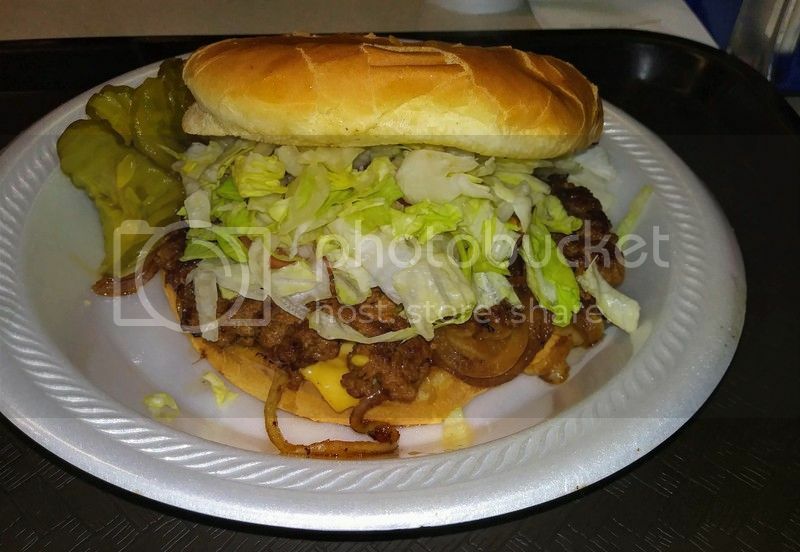 Clarke's burgers come with a slice of onion underneath the roll. I read that is an old tradition of theirs. I also appreciated that it came on a basic potato burger bun, rather than the almost standard, heavier brioche bun that most places now serve thick, pub-style burgers on. I don't like heavy rolls with burgers. 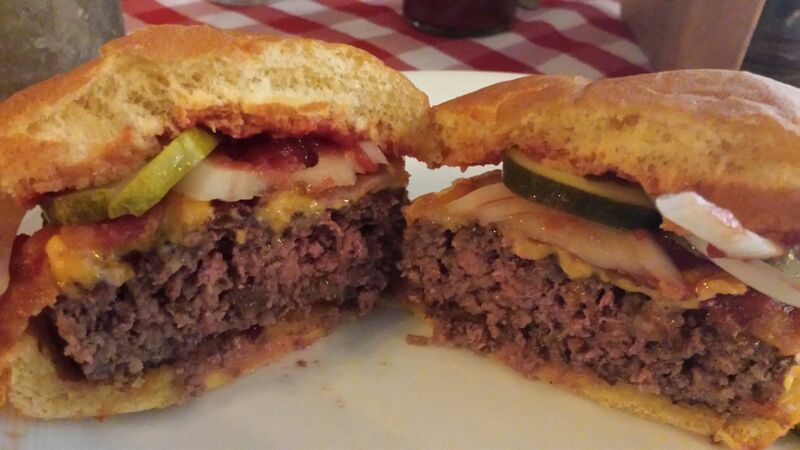 A little less pink than what I like, too, but still a good-looking burger. Potato buns are a nice upgrade over regular white bread buns. Looks good! Are those house made pickles? I'm not sure about that. My burger came with bread & butter pickles, but I noticed a couple other burgers on the menu came with dill pickles, and I asked for those instead of the bread & butter. They are either house made or a very high quality retailer. It's hard for me to believe that I didn't really contribute to this thread on its first go-around, but my favorite burger picture that I captured is, unfortunately, no longer still available. This was from one of the legendary burger joints in Louisville, Kaelin's, which claimed to have invented the cheeseburger, but appears to have closed about a decade ago. Are you still full? Man, that's big. That's one big assed burger! I think I'd have to go with a single patty version of that one! It sure does look good! Get rid of the salad on top and I'm with you. 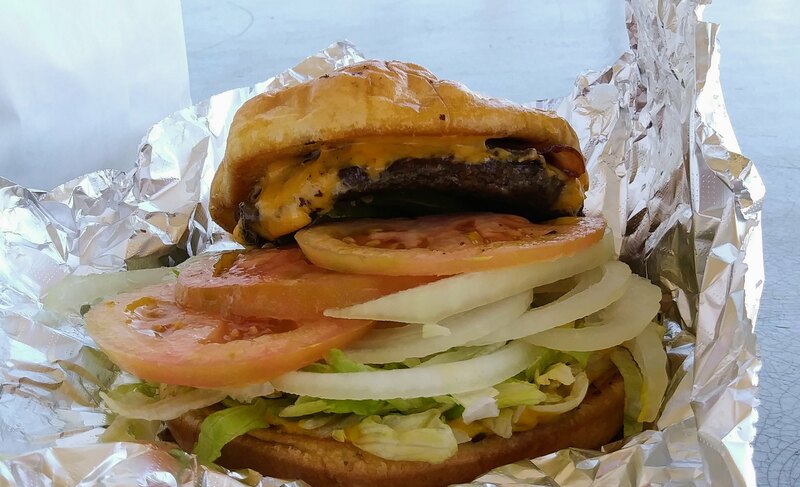 The Geronimo burger from Geronimo Bakery at 1817 N. MLK Ave. in Oklahoma City. You can't see it very well but there are 4 or 5 very thin slices of grilled ham on top of the burger patty. Very good but a bit much for me. I think I will just get a regular cheeseburger next time. Ooh, boy. Do I ever like that! The ham wouldn't be necessary for me. The burger and the veggies would do it for me. Yum.